The wine cellar of the cooperative from Vilalba is placed in C/ Cervantes, 1, in Vilalba dels Arcs (Terra Alta) inside the city centre of this village. The grapes which are used as raw material in the wine-making process come from the members of this entity, who are the majority of farmers of the village. They cultivate the grapes according to the guidelines of the Cooperative, in order to coordinate the efforts and obtain a high-quality product. The wine which the Cooperative elaborates is the result of the effort of a great technically prepared people and of the application of certain production systems which incorporate the most innovative technologies in this sector. Our wine cellar buildings have an area of 3000 m², and they are fitted to the elaboration, vintage and bottling of their wines. The Cooperative has carried out with an important investment in the modernization of its installations. It has been built a new nave of 1230 m², where have been incorporated grapes reception and pressing machinery, and the equipment to the elaboration of red wine. Pressing equipments are based on a pneumatic press system: it is a little aggressive system, which purpose is to make the most of the higher quality must. 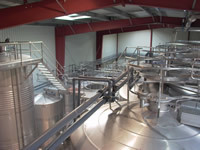 Fermentation is made below controlled temperature in order to favour the maximum quality of the product. 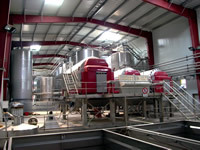 The elaboration of red wine is made in self-emptying tanks, which allow the automation of this phase of the productive process. 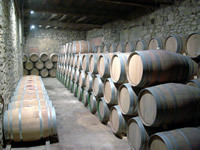 Wines vintage is made in high quality oak tree wineskins with a strict control of environmental factors of the cava*. In general, all equipments of the wine cellar are made with stainless steel, which is the most used material in agro-food industries. Our wine cellar is designed to do a correctly management in environmental aspects (waste products, water waste…), so that it is guaranteed a total respect by our environment. * A sparkling white Catalan wine, similar to champagne.